Nonetheless, numerous people chimed in with new suggestions, the sincerity of which was, again, difficult to ascertain. For example, was the person who suggested using a percent sign instead of the asterisk sincere? Maybe. But what about the one who said the ampersand looked “like a jolly fat man in convulsions of laughter,”? Probably not. Of course, then there’s the person who proposed a complete taxonomy and scale of joke types and values, complete with a coding schema. But what should we expect? They are, of course, computer scientists. It was after this exchange that Fahlman proposed his smiley face. It was the first ever emoticon (although that term, a portmanteau of “emotion” and “icon,” wasn’t regularly used until 1994). In the same post, he suggested that maybe a colon, hyphen and opening parenthesis- :-( -might be used to indicate serious posts. Other posters began to use the smiley face to mark jokes, and the convention quickly spread. It also mutated to all kinds of typographical pictographs. The frowny face that Fahlman created came to express sadness rather than earnestness. 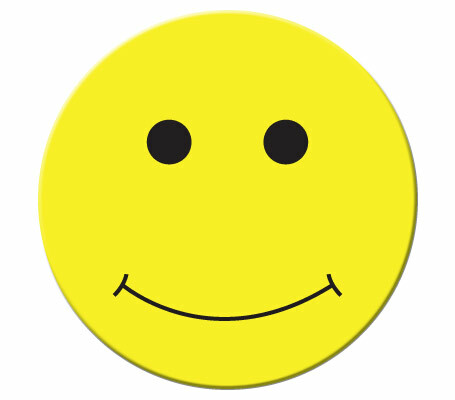 But the smiley face remains part of the common language of email, as do many other emoticons. As for clarity in the things people write? That can only be remedied by the quality and care of the writer. And since few of us take the time to write clearly and carefully, and even fewer possess the talents, perhaps the smiley face is a gift. To those who say that good writers have no need to express themselves with pictures but rather, words, Mr. Fahlman also has a point of view. “To a large degree, I agree. Perhaps the email smiley face has done more to degrade our written communication than to improve it.” He goes on to say that the average internet user doesn’t have the literary skills of Shakespeare or Twain, and isn’t capable of rendering jokes as exquisitely as they. Furthermore, he argues that the Internet is such a categorically different medium than traditional publishing, one that encourages such call-and-response from readers—that to not have a way to clearly define a joke invites too much misunderstanding and chaos.